The book provides a comprehensive compilation of fundamentals, technical solutions and applications for medical imaging systems. It is intended as a handbook for students in biomedical engineering, for medical physicists, and for engineers working on medical technologies, as well as for lecturers at universities and engineering schools. For qualified personnel at hospitals, and physicians working with these instruments it serves as a basic source of information. This also applies for service engineers and marketing specialists. The book starts with the representation of the physical basics of image processing, implying some knowledge of Fourier transforms. After that, experienced authors describe technical solutions and applications for imaging systems in medical diagnostics. The applications comprise the fields of X-ray diagnostics, computed tomography, nuclear medical diagnostics, magnetic resonance imaging, sonography, molecular imaging and hybrid systems. Considering the increasing importance of software based solutions, emphasis is also laid on the imaging software platform and hospital information systems. 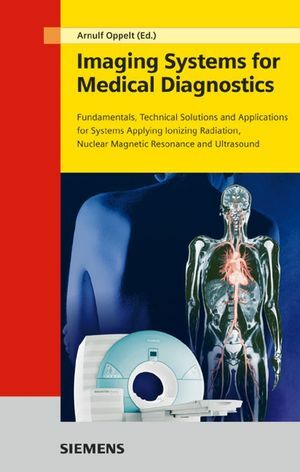 Arnulf Oppelt is the author of Imaging Systems for Medical Diagnostics: Fundamentals, Technical Solutions and Applications for Systems Applying Ionizing Radiation, Nuclear Magnetic Resonance and Ultrasound, 2nd Edition, published by Wiley. PART I: PRINCIPLES OF IMAGE PROCESSING. 2. Subjective Assessment of Image Quality. PART II: PHYSICS OF IMAGING. 7. Concepts in Magnetic Resonance Imaging. 8. Physical Principles of Medical Ultrasound. 10. Principles of Image Reconstruction. 12. X-Ray Diagnostics: Tubes, Generators, Detectors, X-ray systems,3D imaging, Mammography. 14. Nuclear Medicine: Imaging with Single Photon Emitters - Measurement Principles and Devices, SPECT Systems, PET Systems. 17. Special and Hybrid Systems. PART V: INFORMATION PROCESSING AND DISTRIBUTION. 19. Imaging Platform for medical imaging. 20. Computer-Aided Detection and Diagnostics.